We understand how much of a pain it can be to clean a front load dryer, take care of refrigerator noise, find the right person for filter repair and search for and travel to the repair centres of various brands across Greater Noida. Team UrbanClap has therefore devised ways in which you can avail all the above mentioned services through just a few clicks. UrbanClap can provide you with professionals who can fix your Godrej washing machine as early as you require. The convenience that UrbanClap provides is compared to none. All of this at unbelievably low rates. Book your service now! The machine may have a faulty basket gasket or a tub seal and bearing that must be replaced - in this case, put in a request to have a Godrej washing machine repair person check your appliance out, immediately. The professional can also help you install “no-burst” stainless-steel mesh hoses, and lever-type shutoff valves, to prevent potential flood damage. Most of the professionals are stocked with current, fast moving parts. They do this to be able to fix your appliance the same day. But, occasionally, they have to order parts from the company distributors, which can sometimes take one to five business days. Make sure your washer is leveled and you have filled sufficient water in the tub for your desired size of wash load. Insufficient water can cause imbalance. Our professionals can help by giving the unit a full diagnostic check to find the exact problem and fix it. Performance and presentation are the two primary attributes of Godrej washing machines. They are not just well-built to facilitate a smooth washing experience but are also renowned for their designs. Top load and inclined drum washing machines are available in the Godrej fully automatic washing machines category. In fact, Godrej was the first brand in India to introduce an inclined drum front loading washing machine. With superior technologies like Direct Drive technology and U-sonic stain remover, these washing machines curtail half of your washing woes. Hence, any trouble with such a valuable appliance can cause chaos, especially when you need a particular set of clothes for work or festive occasions. In such state of affairs, one platform that can lend you instant relief is UrbanClap. UrbanClap’s Godrej washing machine repair service helps you get a serviceman within no time that further aids in getting your washing machine mess cleaned up as soon as possible. 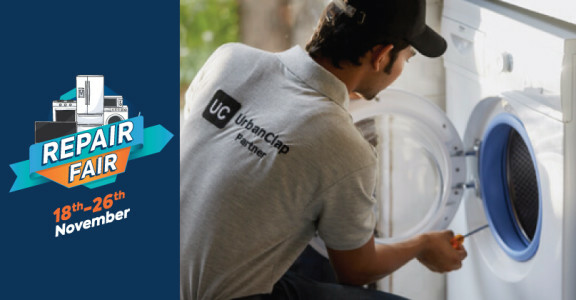 Visit the UrbanClap website or app and type ‘washing machine repair’ in the search box. A pop-up box will appear with a set of questions. Answer these questions with the type and brand of your washing machine, the type of service required, your preferred location, time etc. Once you are finished answering them, your request will be uploaded and a professional will be at your designated location in no time. Abnormal machine sound: Choose this option if your Godrej washing machine is making noises and you want an expert to get this fixed. Installation: To get your new Godrej washing machine installed appropriately, select this alternative. Un-installation: If you feel the need to get your existing washing machine uninstalled with professional help, select this option. Washer spinning abnormally: If you are noticing something abnormal in the washer like its uneven speed, etc., and wish to get it repaired or checked, click on this option. Other: Go for this last option if you are facing any problem with your washing machine, other than the ones listed above. Why UrbanClap Godrej Washing Machine Repair Service in Delhi ? Experienced professionals: All the technicians and professionals are qualified and trained. Each professional is hired only after a thorough background and qualification check. Insured services: Along with providing services, we also feel responsible for customer protection. UrbanClap gives an insurance of up to INR 10,000 against damages. Versatile services: UrbanClap provides services on all types of washing machines. Whether your Godrej washing machine is a top load or front load, our professionals can fix them all. Guarantee: We take complete responsibility for our services and hence we provide a 30 days guarantee on our Godrej washing machine repair services.